It's apple season, and if you've got apples, I've got a great recipe for slow cooker applesauce! Crockpot Chunky Gingered Applesauce is so easy and delicious, I guarantee you'll be making this homemade applesauce over and over again! Flavored with vanilla, cinnamon, and the secret ingredient...fresh ginger, it's going to be your new favorite way to eat apples! 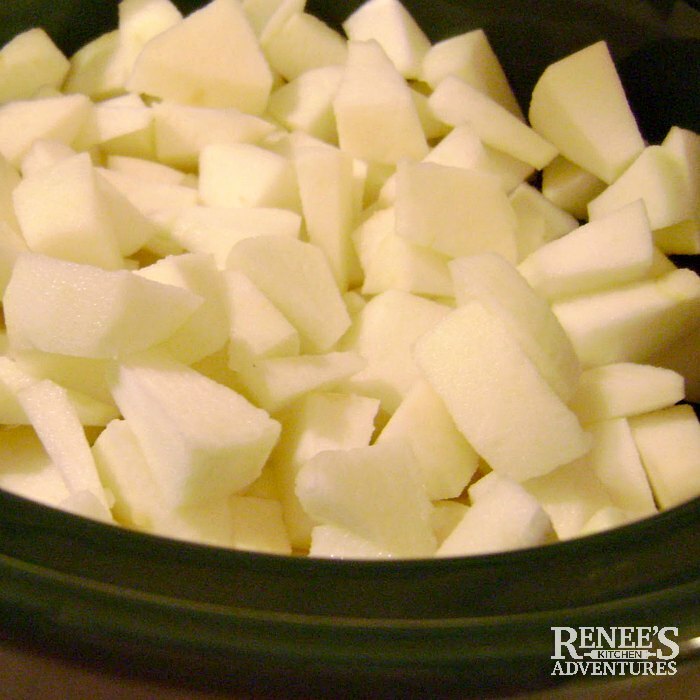 This slow cooker applesauce with ginger recipe was first published on Renee's Kitchen Adventures way back in 2010. When I made that delicious Applesauce Spice Cake last week, it reminded me that I had published a fantastic recipe on this blog for homemade applesauce several years ago. I have nothing against store bought applesauce, but homemade applesauce is just so much better! It's got so much more flavor. And, aside from peeling and coring out the apples, is barely any work at all when you use your slow cooker. That's when I remembered how much I love this slow cooker applesauce with ginger recipe. So I dug it out of the archives, decided to give it a face lift and share it again! 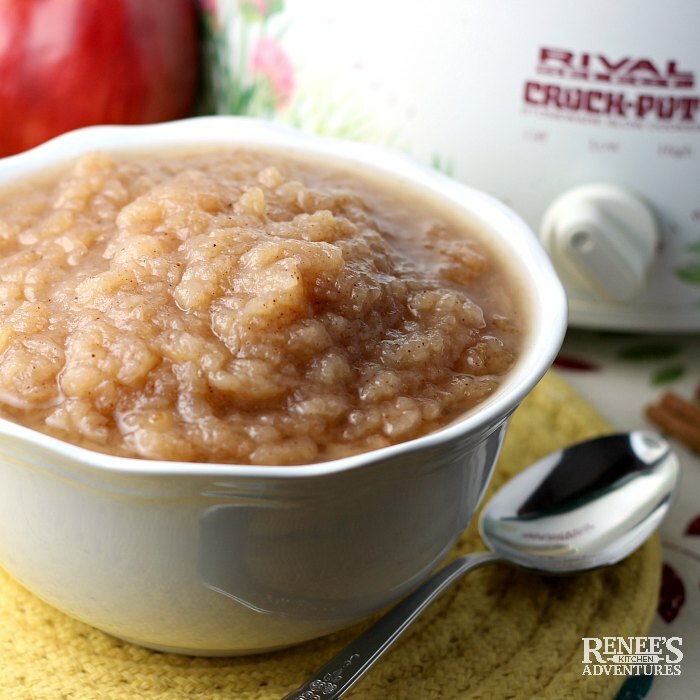 Crockpot applesauce is so incredibly easy, you'll never want to make applesauce any other way. And, if you've never made homemade applesauce before, it's a great recipe to get you started! What kind of apples are best for making applesauce? Not all apple varieties are available at all times, so experiment with different ones until you find a few you like best! I've even used a combination of apple varieties when I make this sauce. Each apple variety will lend a slightly different flavor profile and degree of sweetness or tartness and texture to your homemade applesauce. Here's a handy apple chart from one of my favorite local orchards to help you choose what apples to use in your slow cooker applesauce or baked goods! 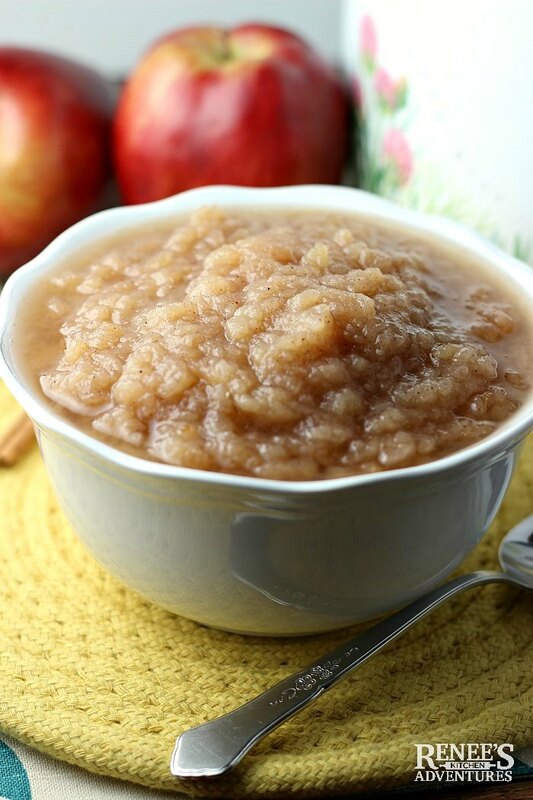 This slow cooker applesauce is the best applesauce recipe! I love the recipe as it's written, but feel free to alter the additions as you like. Not a fan of ginger? Leave it out. Looking for an unsweetened applesauce recipe to make? Don't add the brown sugar and use water instead of apple cider. Want a completely smooth homemade applesauce? Blend the cooked applesauce with an immersion blender right in the slow cooker. 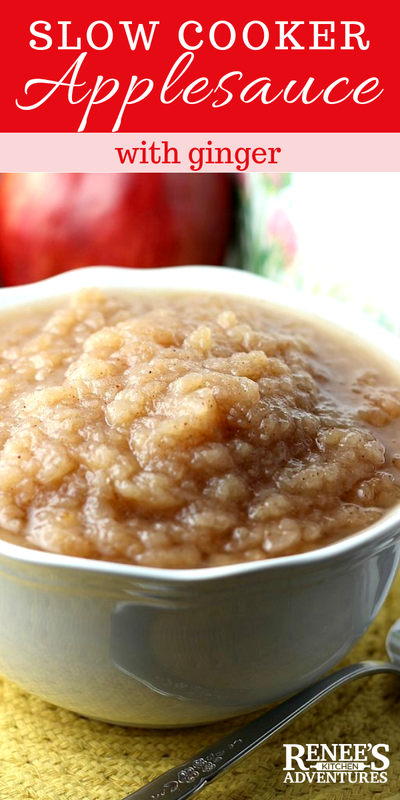 This slow cooker applesauce with ginger is so good, I've even eaten it as a dessert! But it also goes great alongside a great pork recipe! So what are you waiting for? 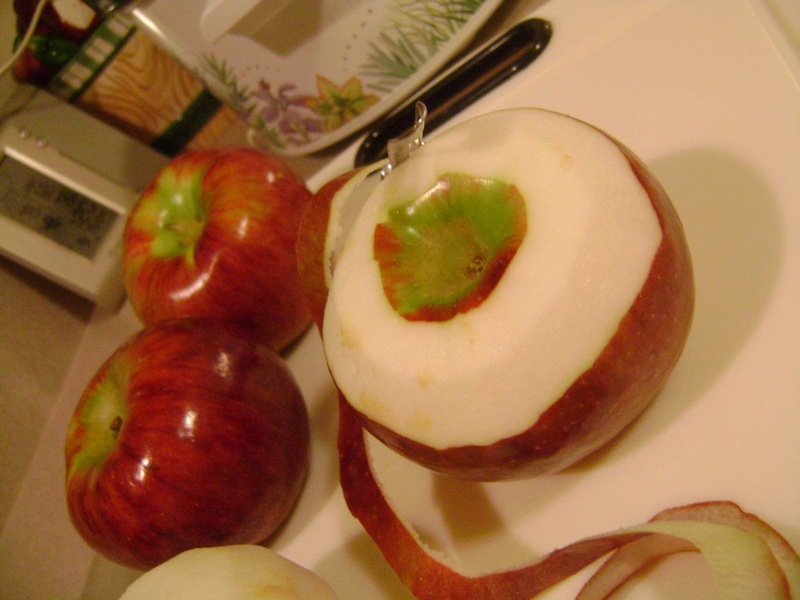 Go out and get some apples and get busy in the kitchen! Warm spices of fresh ginger, cinnamon, and vanilla flavor this easy to make slow cooker applesauce. Put all ingredients into a 6 quart slow cooker, stir, and cover. Cook on LOW for 4 - 6 hours or on HIGH for 2 - 4 hours, or until the apples are soft enough to form sauce. 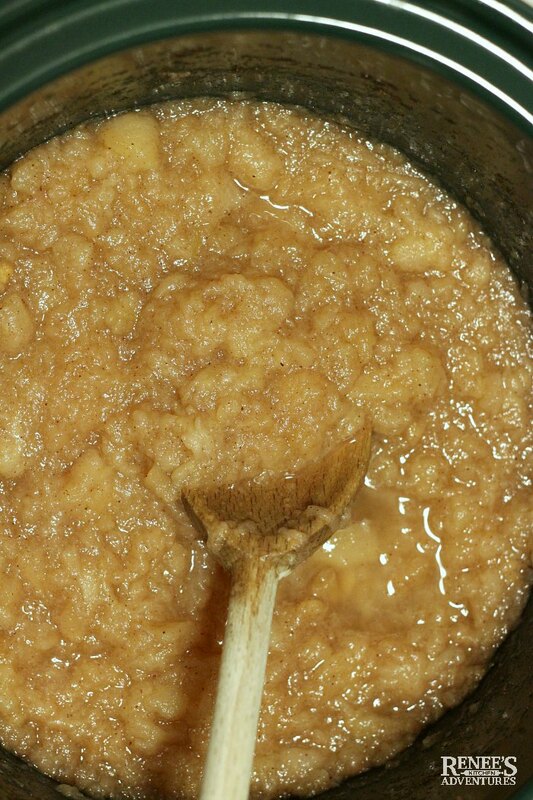 Stir with wooden spoon to break up apple into sauce. Serve warm or cold. Cool and store in refrigerator. For a less liquidy sauce, omit the cider or water. The apples will give off liquid as they cook. I prefer to use the cider for flavor and don't find the sauce to liquidy. Serving size is approximately 1/2 cup. Don't forget to pin Slow Cooker Applesauce! Is this 1 point+ or zero points+? This sounds fantastic! And with the pancakes! Yum! @ Melissa...this was one of the original recipe published with the old WW points...with the new points plus, it should work out to zero, and to be sure you could sub the brown sugar for splenda, or if your apples are sweet enough, leave the sugar out all together. It is an easy and delicious applesauce that can be used in recipes or eaten alone! The ginger adds such depth to it! hope this helps! Fun! I've never made homemade applesauce, can't wait to try! I hope you love it as much as I do! Thanks for stopping by!